Justin Peters hits it out of the park with this teaching. Here, he is clear what the Bible says as compared to those who claim that they have visited heaven or hell. For the record, books like “Heaven is for Real” are nothing but lies. Our Eternal Sabbath is Alive! It was a long three days, but some time between sundown on the old Sabbath and sunrise, the Lord Jesus Christ rose victorious over death, hell, and the grave! He is now our Eternal Sabbath for all who place their faith in Him alone. Maranatha! Quotes: The road most densely populated with thieves. From the not-so-fine folks at Westboro Baptist Church to Rob Bell, it seems that nearly everyone has an opinion about Hell and who will end up there. Steve Gregg’s book promises to tell us everything we want to know about the subject, claiming to present “three Christian views of God’s final solution to the problem of sin”. This leads the reader to expect a biblical defense and analysis of this topic. These three views are listed as the Traditional, Conditional, and Restorational views. I hope to show you how this works out so you can determine if this book will strengthen your faith in the biblical God. 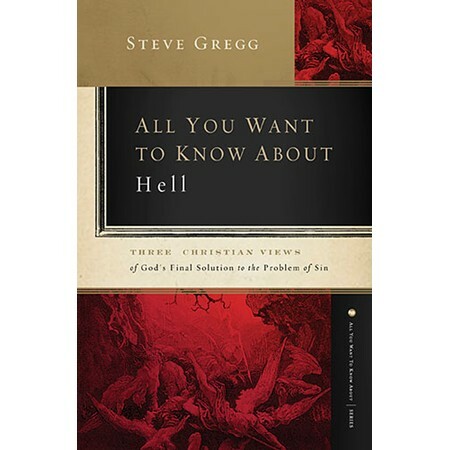 The forward, ostensibly written by Gregg, reveals his bias early on as he asks the reader to conduct a thought experiment – If the Bible said nothing about hell, which of the three views would you expect God to choose based on what the Bible says about God; and then, “Based upon your character, which would you wish for Him to choose?” We will see this orientation repeated within this book – looking at creator God or some doctrine from a humanistic perspective rather than a biblical one. This is a recipe for trouble. The Introduction is a walk through various man-centered views about innocence and goodness and punishment, accompanied by the assertion that none of these three views about hell “denies any major affirmation of the gospel” (page 4). Prior to providing a summary of the three views, Gregg says, “I have come to believe that none of these positions can justly be called “heretical.” All are held by evangelicals who accept the authority of Scripture.” Gregg includes Roman Catholics, Christian liberals, and neo-orthodox within his overly broad category of “evangelicals” and he has a rather liberal view of “accepting the authority of Scripture.” This causes some of the author’s confusion on this topic. After describing these three views, he tells us his intention is not to promote any one view. The overviews provided in the Introduction include myriad proof-texts for each – a particularly unsatisfactory method of supporting a doctrinal position, as lack of context allows virtually any Scripture to be claimed by virtually anyone for virtually any argument. And a common thread throughout the book is one of questioning the traditional view. One thing about our author which is very good – he is not blinded by what he was taught and does seek to prompt the reader to think about what he reads in Scripture. This is a good thing, one that I believe most folks pay little heed to. A case in point – many English Bibles carelessly use the word “hell” for the grave and for hell. The Apostles’ Creed doesn’t help in this particular case. We must be careful how we read. Gregg starts off chapter 1 (page 17) saying, “Atheists find the doctrine (of hell) to be a strong deterrent to their belief in the God of Christianity.” Perhaps he meant to say that atheist claim this to be so, they hate God and will do what they can to judge the Judge of all creation. The truth about atheists is that they are dead in sin and unable to believe in Christ – unless the Spirit of God raise them up and give them faith. In his supposedly even-handed review of the Calvinistic view, Gregg actually ridicules it by describing this view of God as “a bipolar entity” who is “about equally divided between extreme love and extreme hatred”, and declare this not to reflect the biblical God (page 23). An honest reading of just about any book in the Bible shows the Creator, Sustainer, and Judge of all flesh as One Who saves whom He wishes and destroys whom He wishes. Romans 9 is a prime example of this dynamic picture of the only true God. Throughout this chapter our author portrays hell as the product of human thought, pulls Scripture out of context to make a point, and claims the Roman Catholic Church’s political campaigns known as the Crusades demonstrates how hellish Christians can be. Here’s that humanistic view – anyone who claims to be a Christian is to be accepted as one. Then, when some professing Christians do hellish things, we can drag the Bible through the mud with them. While any Christian is capable of doing pretty much any wicked thing, every true Christian is indwelt by the Holy Spirit and not be at peace with sin. The decades-long Crusades do not represent Christians who got lazy and lapsed into sin. It was a deliberate series of acts that cannot be reconciled to Christianity, organized by a cult that has done more to kill Christians and keep the Bible locked up than the Muslims ever have. Gregg spills a lot of ink telling us that hell is not mentioned very much in Scripture and that hell was not a “front-burner” issue for the Savior or His apostles. “They must have found something other than terror to motivate them to obedience and service.” Our author laments gospel preaching that is basically a warning to escape the coming judgment of God – rightfully so, as that is not faithful preaching. The gospel is fundamentally about the redemption of sinners by grace alone through faith alone in Christ alone – to be with Him forever on the new earth. Gregg is right (pg 61) to point out that repentance accompanies faith and should not be ignored in gospel preaching. Two pages later, he tells us of devout Christian man who testified that “he could not become a Christian (that is, he could not love God) until he actually came to disbelieve in the traditional doctrine of hell.” This is not the way a person is saved – this is the story of a man seeking a god made in his image because he does not like the God Who is. He quotes Pinnock again, propping up the notion that people must be convinced to save themselves, and then says “We must not allow pragmatism to drive our message. Our message must be the truth. Any deviation from what the Bible really teaches may produce undesirable and unforeseen consequences.” And yet he keeps on bringing up ideas and suggestions that God will not punish unrepentant sinners for eternity – sounding to me more like the serpent in the garden than a Christian theologian. And then he ends the chapter reminding us, “God alone is enough for those who seek and find Him.” AMEN! Gregg’s personal bias shows forth in the chapter discussing Lazarus and the rich man, as he asserts (page 70) that the scene of demons emerging from the pit in Rev 9, 11, and 20 “is not properly identified with what we commonly think of as hell.” Two pages later we read, “Hades itself is destined to be cast into the lake of fire (Rev 20:14), so it obviously is not the same thing as the lake of fire.” Each of these scenes presents the abyss where demons come from and go back to – what I commonly think of as hell. I also see Revelation as a picture book of progressive parallel series of re-tellings of the church age, culminating with the return of Christ, the judgment of the people of earth, and the establishment of the new earth where He will reign with all the redeemed for eternity. Since John’s Apocalypse is apocalyptic literature, we need to see the word pictures as such and not take them literally. This helps one not fall into the problems that hound Gregg. Chapter 5 is a word study on Gehenna and Aionios, and our author seems to be stuck in his literal interpretative mode, seeing this word refer to various places where people and trash were burnt, etc. and having trouble seeing that as a metaphor for the place where unrepentant sinners will be punished for eternity. Having previously told us, rightly, that a doctrine does not need to be repeated multiple times to be valid, Gregg now turns the other cheek and notes that Jesus spoke about hell very little. He sums up this teaching thusly (page 89): “We are told almost nothing about it (hell) in these places (the gospel accounts), except that bodies (footnote Matt 5:29,30; 18:9; Mark 9:43,45,47) can be thrown into “everlasting” and “unquenchable” fire there (footnote Matt 18:8; Mark 9:43,45,48), resulting in a fate worse than mere mutilation or martyrdom, involving the destruction of soul and body (footnote Matt 10:28).” He then laments that this does not seem to be enough detail or discussion about something as important as eternal punishment. If one has a biblical understanding of redemptive history, sees the curses in Deut 29 for anyone who fails to keep the law, grasps the picture of atonement, partially comprehends the holiness of God and His righteous hatred of sin, see how Christians are redeemed and rescued from the wrath of God by the Lamb of God – those few passages Gregg cited are more than adequate to show what will happen to all whose name is not written in the Lamb’s Book of Life. The temporal references to punishment and fire are shadows of the eternal things they represent just as sure as the Levitical sacrifices were (Heb 8:5). It does the child of God no good at all to discount the seriousness of sin, making hell little more than a rehabilitation camp, and denigrating the perfection of Christ in the flesh and His atoning sacrifice for the elect. In discussing the Greek word, aionios, Gregg again gets bogged down in literal, temporal uses and the definition that fits those circumstances – and then imposes that definition on the eternal, spiritual circumstances. This is done with the apparent aim of trying to show that eternal destruction means something less, something more bearable, something redemptive; something unbiblical. He rightly warns about the improper use of concordances, but (page 101) uses a footnote to tell us why we should not think of this Greek word as meaning eternal – because in 20 out of more than 320 uses it points to something in the past, but “rarely if ever to a limitless past.” More than 300 times the word indicates indefinite continuance, 20 times it points to the past. When it points to the past, it normally doesn’t mean limitless. So when this word points to the future and, in more than 300 instances, indicates indefinite continuance, we should think it doesn’t mean endless. It’s just not as explicit as Gregg would like it, not clear enough for those without spiritual eyes to see and believe. Lastly, we’ll take a look at his defense of the traditional view – that hell is the eternal punishment of fallen angels and unrepentant sinners. He appears to have no problem with the idea that the soul of man is eternal. That’s his first point in defending this view. Next up is the nature of hell – fire can be figurative or literal, some think hell is simply being ignored by God (page 139). As noted above, we see both in what we are saved from and what demons and unredeemed are destined to suffer, those in hell are not separated from God, they are separated from everything except His wrath. And His wrath they will suffer under for an indefinite continuance – eternity. His 3rd point is that repentance will be unavailable in hell. How could there be, considering the judgment that determines destiny happens when man dies? Repentance is a gift from God to His redeemed – not something extended to those in hell. This is one reason unlimited atonement is wrong thinking – the blood of Jesus would not have been shed for anyone not predestined by God the Father and sealed by God the Spirit. The three holy persons of the Trinity are unified – why would they be at odds with one another in this greatest exchange? The 4th point is the right perspective that the saints’ joy in heaven (or the new earth) will not be affected or mitigated by knowledge of the damnation of the lost. Our joy will based on being with God, not on being forgetful of His justice on the wicked. There but by the grace of God go you and I. In his cross-examination of this position, Gregg argues for temporal interpretations of passages such as Matt 3:10 & 12, insisting they are nor eschatalogical. But the student of God’s Word will know that many prophecies in the Old and New Testaments have a “near” and a “far” application – such as the famous citation in Matt 2:15, claiming Hosea’s prophecy for Jesus, that most certainly was written as a remembrance of the faithfulness of God in redeeming Israel from Egypt. And the same story of John the Baptist cited in Mark 3:10 is found in Luke 3, where verse 15 makes it clear that the winnowing John speaks of is eschatalogical. When Gregg discussed “the wages of sin”, he sides with liberals who think God would have spoken clearly to the ancient people if He intended them to know they might face eternal punishment (page 143). But the Bible tells us that, when Adam ate from the forbidden tree, his eyes were opened and he knew good and evil. From that point on, all human flesh knew right from wrong (Roman 2:12 – 15), just as Cain knew murder was wrong without ever being told. Do we believe the Word of God or a liberal that questions it? When the author ponders “the worm that does not die”, he argues that this is used to describe corpses – and corpses are not what traditionalists say are in hell. So Is 66:24 can’t be talking about hell. He skips right over Psalm 22:6 and Job 25:6 where man is called a worm – so we take our meaning from context and know that when the Bible refers to worms, it can mean men who are not corpses. Once again, in his argument starting on page 178, Gregg acknowledges Revelation to be apocalyptic literature (page 179) and applies that to the “torment” described in Rev 14:10-11, but not so the “fire and brimstone”. He asserts (page 179) “However, “fire and brimstone” were previously seen in Revelation in connection with temporal judgment that are not associated with the lake of fire (Rev 9:17-18). He then quotes William Fudge, who was educated by the Church of Christ (at Abilene Christian College) and denies that man’s soul is immortal; because such a thing would require the traditional view of hell. The quote from Fudge: “It is not at all clear that Revelation 14:9-11 is even speaking about final punishment.” Let’s look at this passage and see. Here’s the cited text: Revelation 14:9-11 And a third angel followed them and spoke with a loud voice: “If anyone worships the beast and his image and receives a mark on his forehead or on his hand, he will also drink the wine of God’s wrath, which is mixed full strength in the cup of His anger. He will be tormented with fire and sulfur in the sight of the holy angels and in the sight of the Lamb, and the smoke of their torment will go up forever and ever. There is no rest day or night for those who worship the beast and his image, or anyone who receives the mark of his name. Many people who see John’s Apocalypse in the idealist view see seven parallel and progressive retellings of the age between Christ’s two advents, with the end of this age being told several times – including the end of chapter 14. Read the balance of this chapter and it becomes clear we’re reading the end of the age and doom that awaits all who worship not the God of heaven and earth. He continues to claim the temporal judgments, such as what God poured out on Sodom and Gomorrah, mean that references to them and the use of similar terms (like fire and brimstone) must not be eternal. But we do see how temporal things are signs and types of eternal things (such as in Hebrews 9:1-10). And since we know that the soul of man lives forever (Gregg has pointed us to some of these, such as Dan 12:2-3), and since unrepentant sinners have sinned against the perfect, absolutely holy God, and they will not stop sinning once in hell, their torment will be eternal. And one last comment on this book, because it is as the preacher said in Ecclesiastes 12:12, there is no end to the making of many books, and much study wearies the body. Gregg quotes another liberal, as John Stott ended up, in observing that Rev 14:11 says “it is the smoke (evidence that the fire has done its work) which ‘rises forever and ever’” – in making the assertion that people are not punished “forever and ever”. It’s only the smoke of their “light and momentary” torment that produces smoke which “rises forever and ever”. Every camper knows that the only way smoke will continue to rise is if the fire continues to have fuel. Without fuel, the smoke will dissipate and slowly stop – it will not continue forever and ever. And since the Lord Jesus described hell (Mark 9:44, 46, & 48) as the unquenchable fire, where Their worm does not die, and the fire is not quenched. How much more clear can it be? Living man is described as a worm; in hell, the worm does not die and the fire is not quenched. And the smoke of that fire which is not quenched as it burns those who dieing do not die, rise forever and ever – as they never repent but keep on cursing God throughout eternity. This is the biblical truth of hell that soft-headed liberals cannot face. Holy God redeems some and saves us “from the wrath to come” (1 Thess 1:10). Those for whom He did not shed His blood He will reject, telling them ‘I never knew you! Depart from Me, you lawbreakers!’ On Judgment Day, those whose names are not written in the Lamb’s Book of Life (which were written before the foundation of the world – see Rev 13:8) will look for a place to hide from the Lamb of God – but there will be no place to hide, no deed done in darkness that will not be revealed. Just as Satan and his demons are thrown into the lake of fire, where they will be tormented day and night forever and ever (Rev 14:10), so will all those who were not predestined to eternal life be cast into the lake of fire. The Bible calls this “the second death” (Rev 14:14). Revelation 20:15 tells us And anyone not found written in the book of life was thrown into the lake of fire. Contrary to the question Gregg would to plant in our minds, in this one passage of God’s holy Word we see that those whose names are not written in the Lamb’s Book of Life are thrown into the lake of fire, the same place Satan and his demon are thrown, where they all will be tormented forever – and the smoke of their torment will go up forever and ever. This is the second death that all men deserve. This is the wrath of God from which we who are in Christ Jesus are shielded (Romans 8:1). This is the doom that awaits all who do not believe and will not repent. The gospel of Jesus Christ is all about Him. It is a reminder that all men have rebelled against Holy God and all deserve His wrath. But the Lord Jesus has gone before us – the Law-giver became the Law-keeper on the account of the Law-breakers. He has surrendered His perfect life as an atonement for people of every nation, tribe, and tongue – all those whose names were written in the Lamb’s Books of Life before He founded the world. We have a surety that cannot be taken from us – there is, therefore, no condemnation for those who are in Christ Jesus. And since there is no other name on earth or in heaven by which man must be saved, all those who do not place their faith and trust in Him, who do not repent daily and seek to honor Him will suffer the just reward for the sin they carry in their flesh as children of Adam and the sin they commit in their bodies because they are slaves to it. There is a penalty to pay and if Christ has not paid your debt, you will suffer for eternity racking up a bill that will never be marked, “PAID IN FULL!” Therefore, believe on Jesus, repent and seek Him while is it yet today! Hell is not part of the gospel. The Bible does not give us a lot of details on hell, just as does not give a lot of details on heaven or the new earth, which will be the eternal home for Christians. That doesn’t mean these issued are unimportant, but it means they are not of first priority. “What I must do to be saved?” That is the question which must be answered. That is why the gospel is of first importance. We should not argue secondary issued with those who are “outside the camp”. They need to believe in Jesus, not figure out hell. We who are in Christ are to never stop growing in faith and knowledge of Him. All else is secondary. Think on heavenly things – that is where we are seated with Christ at this moment!